Health leaders were recognized for their commitment to advancing health for all in their countries. Hon Dr. Gashumba, Minister of Health of Rwanda, received the UHC Presidential Champion award on behalf of HE Paul Kagame, President of Rwanda, and Hon Dr Amir Aman, Minister of Health, Ethiopia, received the UHC Ministerial Champion award for their exemplary efforts to expand health care access to their populations. 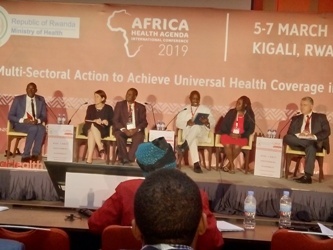 The theme of the AHAIC 2019 chapter was 2030 Now: Multi-Sectoral Action to Achieve Universal Health Coverage in Africa and brought together 1540 delegates from more than 60 partners working on the health agenda to gain a deeper understanding of the greatest health challenges in Africa focusing on access, quality, financing and accountability. The conference provided an opportunity for delegates to network with influencers from different sectors and find opportunities to collaborate and be a part of conversations that help influence policymaker and donor priorities to advance Universal Health Coverage in Africa. The Health Systems Advocacy Partners (HSAP) that comprise: ACHEST, Amref Health Africa, Health Action International (HAI) represented by Coalition for Health Promotion and Social Development (HEPS), Wemos and the Dutch Ministry of Foreign Affairs held a joint Storytelling session to inspire change agents through the stories of their contribution in communities realizing their right to accessible and quality Sexual and Reproductive Health Rights. And to find out how to create effective policy dialogues around health in the Health Systems Advocacy Partnership project. Dr. Patrick Kadama, Director Health Policy at ACHEST told the story of ACHESTs contribution in building capacity of CSOs to occupy the policy spaces. “Improving the capacity of CSOs is immeasurable. The great progress in building capacity of other partners in the African region will have a ripple effect and sustainability if indigenous CSOs are capacitated so that the construct of UHC as a means to an end of managing better health outcomes and social exclusion is realized.” Dr. Kadama said. Amanda Banda of Wemos told the story of Wemos’ contribution in working with the Ministry of Health in Malawi to secure a commitment to finding a solution to the inadequacies in Health Financing. Denis Kibira, the Executive Director of HEPS told the story of HEPS’ contribution in working with Ministry of Health in Uganda to get the Ministry’s commitment on finding a solution to the adverse effects of SRH commodities among women. Amref Health Africa on the other hand told the story of their contribution in creating spaces for the youth in Kenya to engage with the political leadership through starting a Youth Parliament. Prof. Miriam Were, the Chancellor of Moi University in Kenya noted that as women are dying during child birth, boys and men are dying too. There is need to empower men as well. The cross gender empowerment must happen in the communities and households if it must happen at the national level. Many Bills have not been passed into law because the involvement has not happened at the household and community levels. The well attended breakout session organized in a way to mimic a campfire setting presented an opportunity for the HSA partners to share stories about successes and challenges in fostering inclusive dialogues around UHC and SRHR. And concretized on the role civil society have in accelerating the health agenda at local, national, regional, and global level and discussed effective ways to go about this. Perhaps the most rousing plenary was the Closing Ceremony, dedicated to women who are literally changing the world, from the community level to the halls of global policy making. The audience embraced each and every one of the amazing panelists – KatjaIversen, CEO of Women Deliver; Amina Jama Mahmoud, Founder of Women in Global Health Somalia; Professor Miriam Were, Champion for an AIDS-Free Generation; and Cynthia Oning'oi, a passionate advocate against female genital mutilation (FGM), who received a standing ovation for her moving speech on her fight to end FGM. ACHEST was represented at this conference by a delegation of five people that included; Prof. Francis Omaswa, the Executive Director of ACHEST, Dr. Patrick Kadama, the Director Health Policy, Dr. David Okello, Director Non Communicable Diseases and Healthy Aging, Paul Gabula, Program Officer, HSAP and Loice Epetiru, Communications Specialist. The conference provided an opportunity for ACHEST to disseminate its knowledge products that included; The African Health Journey, a fact sheet on inclusion of an Indicator on People Participation in Health Promotion in SDGs and a Policy brief on Universal Health Coverage, Pathway to Health for All.